Influenza is an acute respiratory tract infection caused by the Influenza virus, of which there are three types – A, B and C. All known pandemics were caused by the Influenza A strains due to various factors. The disease is characterized by the sudden onset of chills, malaise, fever, muscular pains and cough. Influenza is found all over the world. It occurs in all countries and affects millions of people. 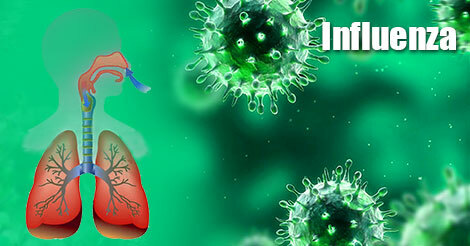 Outbreaks of Influenza A occur virtually every year. Major epidemics occur at intervals of two to three years, and pandemics at intervals of about 10 to 15 years. The first pandemic during the present century occurred in 1918–1919 which affected an estimated 500 million people and killed more than 20 million. In India alone, over six million people died during this pandemic. This pandemic was caused by what is now known as the Swine Influenza virus. Recent pandemics occurred in 1957–58 owing to the Influenza A (H2N2), in 1968 owing to the Influenza A (H3N2)and in 2009 owing to influenza A (H1N1). Outbreaks of Influenza B also occur annually with epidemics occurring at intervals of 407 years. Influenza brought on by the type C virus occurs sporadically as small outbreaks. Influenza is truly an international disease. It occurs in all countries and affects millions of people every year. Its behavior is unpredictable. It may occur in several forms. It may smolder in a community without clinical recognition, being manifest only by serological surveys. It may occur in pandemics every 10 to 15 years due to major antigenic changes, as occurred in 1957 and 1968. Between pandemics, epidemics tend to occur at intervals of about two to three years in the case of Influenza A and four to seven years in the case of Influenza B. However, the periodicity is not regular as in the case of measles or whooping cough because several strains of the virus may be in simultaneous circulation which means that there may be outbreaks of Influenza practically every year, and sometimes even twice a year which has to be verified and diagnosed. Once an epidemic begins, the picture is quite characteristic. Preceded by a few early cases, there is a sudden outburst of the disease. This may be indicated by reports of increased febrile respiratory illness in children, followed by the same in adults. The next event is increased hospitalization of cases and sickness – absenteeism in schools and places of work. Attack rates tend to be high, varying from 10 to 50 per cent. The peak of the epidemic is reached in about three to four weeks, before tending to decline. The time scale is compressed for smaller geographical areas. The unique features of Influenza epidemics are the suddenness with which they arise, and the speed and ease with which they spread. The short incubation period, a large number of sub–clinical cases, a high proportion of susceptible population, short duration of immunity, and an absence of cross–immunity, all contribute to its rapid spread. The fate of the virus during inter–epidemic periods is also known. Possible explanations include transmission of the virus to extra–human reservoirs (pigs, horses, birds) latent infection in humans or continuous transfer from one human to another. This explains the occurrence of sporadic cases.